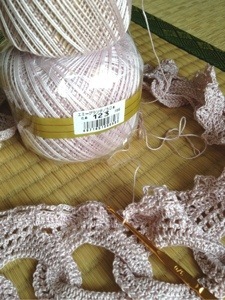 Started a beautiful lace summer scarf in a sweet Sakura Pink. But didn’t consider how much lace thread needed to complete the project. Loved the design, Loved the pattern…until I started to run out of lace color #123. Finally, after 2 months, I found one lonely skein waiting for me at Yuzawaya’s Ginza location!! So now I’m off and crocheting the piece to be ready for the cool summer air conditioning on the trains. Lesson learned! Next time I’ll be purchasing a bit more materials than I expect to use, just in case.